The teaser trailer for The Iron Lady, which casts Meryl Streep as Margaret Thatcher, just went viral and is already causing mixed reactions. When it was announced that Streep would be playing Thatcher, people started predicting an Oscar from the premature get-go. The shared thought was that The Iron Lady would be heavy-handed Oscar bait, full of drama, screams and tears. But watching the trailer, it seems director Phyllida Lloyd (whose only other feature film credit is the Streep-starring Mamma Mia!) is going for a slight, amusing take on the former Prime Minister. Despite being nominated for damn near everything she’s in (amassing 16 total Oscar noms), Streep has only won twice: Best Supporting Actress for Kramer vs. Kramer (1979) and Best Actress for Sophie’s Choice (1982). So let’s do a little Oscar math. 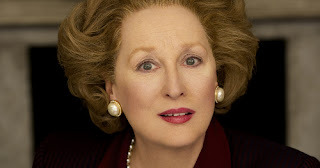 Streep+Thatcher+serious= Oscar gold. Streep+Thatcher+funny= front row seat. The Iron Lady is scheduled for a Dec. 16, 2011 release. What’s With All the Lame Trailers?